Well, good morning! Not to get all celestial on you, but did you know the moon circles the Earth 13 times each year? Did you know you can have an otherworldly level of supernal joy when you realize how insanely good this wine is for the price? One of the finest over-delivering, stellar reds we can find in this range! How do we do it? Depicting our satellite's yearly rotations on the label, the fantastic Lunas XIII is an ultra-tasty blend of old-vine Grenache and Tempranillo --- distinctly Spanish in its personality, it manages to be bright, fresh, juicy, savory and lengthy all at once. This is very much the wine for the old WC Fields quote: "I cook with wine...sometimes I even add it to the food" level of drink-me-with-gusto deliciousness, oh yes! You are seeing that price, right? Loaded with juicy strawberry fruit, cherry extract and sweet cigar box flavors and aromas and a silky texture, we highly recommend buying more than you think you will want...once you taste it you'll see why...truly a steal. We are drinking it (well, several probably) tonight with THIS. MMMMM, paella. We bought as much as was offered, but we'll still run out in hours, probably. Don't miss! Your "house red" problem is solved! 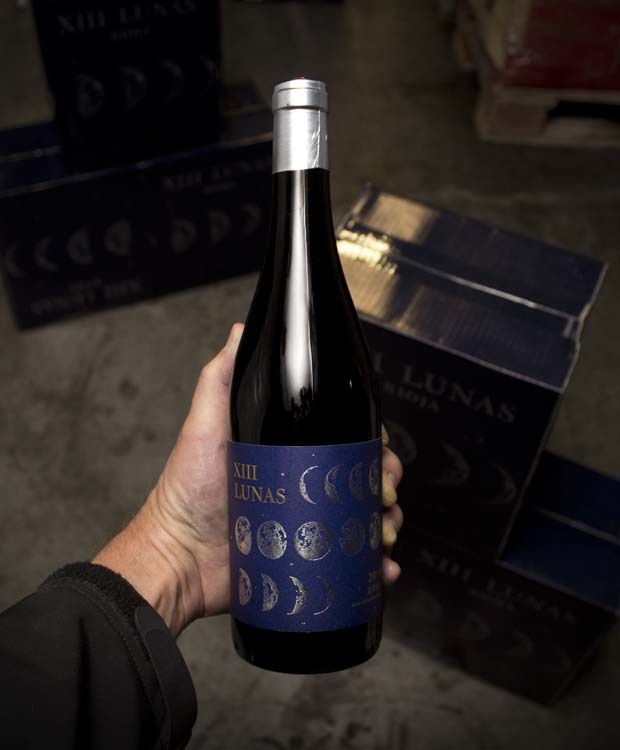 XIII Lunas 2014 is a modern wine of Garnacha and Tempranillo, made in Rioja Alta and aged for thirteen lunar cycles. The name stems from the the fact that, every year, the Moon circles the Earth thirteen times, thus completing 13 lunations. The Najerilla valley, in the Rioja Alta region, is a landscape marked by the vineyards that spread throughout the area. This is where Bodegas Fin de Siglo is located. A cellar owned by the Perelada Group since early 2014. In the town of Arenzana de Abajo, local vine growers have succeded to maintain vines that are more than 100 years old. Vines that are totally adapted to its soil and climate conditions. Bodegas Fin de Siglo is created in 1999 by a small group of families, vine growers of many generations. The main goal was to to take the best out of the old vines of this region. They produce high quality clusters, with small and very concentrated grapes, which allow to make wines with more structure, body and aromas. Currently, Bodegas Fin de Siglo is a member of Peralada Castle's Wineries Group. The vineyards hold the essence of Bodegas Fin de Siglo, which owns 45 hectares and has absolute control over 10 hectares more. There grow both red (Garnacha, Tempranillo, Mazuelo) and white varietals (Viura, Malvasía), all of them autochthonous of the DOCa Rioja. An important number of these vineyards are very old, with some Garnachas being 80 or even more than 100 years old. They produce low yields of selected grapes around 3,500 Kg/ha (the appellation allows up to 6,500 Kg/ha). Bodegas Fin de Siglo controls the winemaking process from the vineyard to the market: pruning of every plot, vines care, monitoring of the ripening process, selective hand harvesting… Everything to obtain grapes of the highest quality. The whole process is also controlled in the cellar, with a perfect traceability.